Is Tanzania Better Than Kenya For a Safari? Both Tanzania and Kenya are renowned for their abundant wildlife, with each country offering classic safari circuits that guarantee great game viewing. But Tanzania has a slight edge here as most of its parks have been voted the best by thousands of travelers, not only because of their top-class facilities but also due to the fact it’s the easiest place in East Africa to see the Big 5: the African Lion, Cape Buffalo, White/Black Rhinoceros, and African Leopard. Kenya is home to the second highest point in Africa, Mount Kenya, which is known for its climbing activities. Tanzania, on the other hand, offers an unrivalled experience of climbing the highest mountain in Africa: Mount Kilimanjaro. This, combined with the hotel facilities on offer, is one of the main reasons why the number of tourists heading to this mountain has surpassed other countries in the region. There are also a variety of other mountain ranges you can visit along the way during your safari. When it comes to beach holidays, both countries boast dazzling tropical beaches you can visit during or after your safari. Kenya is primarily famous for the Diani Beach, which offers safe, shallow water and flawless white sandy beaches. However, there are safety concerns particularly because the region is cut off and that can ruin your experience. Tanzania also offers powder-soft beaches, especially their renowned islands, Zanibar, Pemba or Mafia. The beach break in Tanzania proves far more special, thanks to fewer visitors, superb diving facilities and attractive beach resorts. The Serengeti in Tanzania hosts the largest terrestrial mammal migration in the world, where more than 70 different larger mammal species can be found in diverse habitats. Some of the commonly found large mammals in the region include the popular Blue Wildebeests, Buffalos, Gazelles as well as Zebras. Although Kenya does have a wide range of wildlife on offer, you will only get to see them after they have migrated to Masai Mara after spending most of their time, usually between 7 and 10 months in Tanzanian borders. 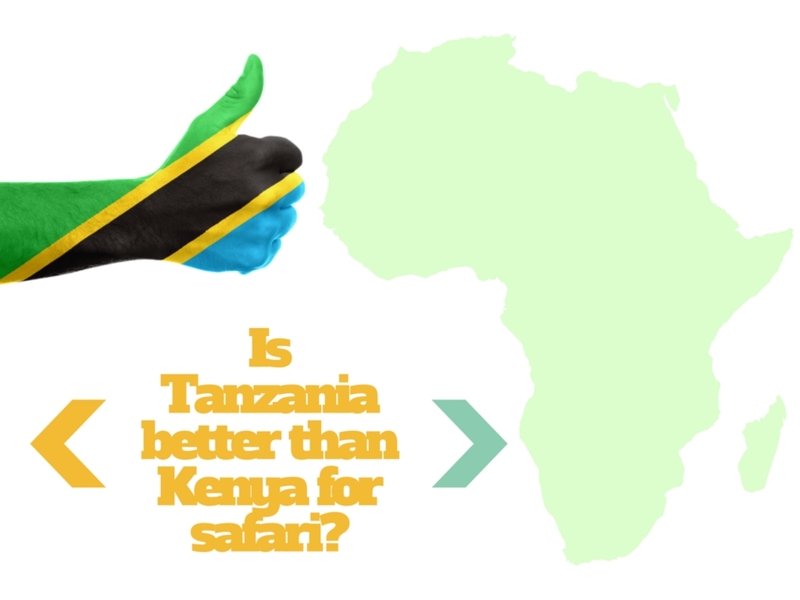 Lastly, Tanzania is a safer country if you are considering planning a safari trip. With the local elections in Kenya causing unrest, it can be risky to travel there at this particular time. All in all, it is safe to say that Tanzania is a better destination than Kenya for a safari, but this doesn’t mean that Kenya isn’t a destination worth considering as well.